Home Costs > How Much Does a Brick Mailbox Cost? How Much Does a Brick Mailbox Cost? A brick mailbox is one of the many options that you can choose when building a mailbox, and this type of mailbox, when compared to other materials, is known to be stronger, more durable, and can complement your home’s decor. How much does it cost to build a brick mailbox? On average, the cost to build a custom brick mailbox can be anywhere between $700 to more than $1,800 if you were to hire a professional. The costs will depend on the design, the size, your geographical location and the contractor you choose. The costs will be closer to the $700 to $1,000 range if the mailbox were hollow on the inside and about double this range if you wanted the contractor to fill the entire interior with concrete, which can help it last longer. Since so many jobs can be so unique, consider getting multiple quotes for free from HomeAdvisor.com. Here, you simply describe your job and contractors will email you with a no-obligation quote. Prefabricated brick mailbox kits are available online, and these kits will come with all of the materials you need in order to create the mailbox. Depending on the design and size, most prefabricated kits will cost anywhere from as little as $400 to more than $1,100. This won’t include the professional labor. The estimates mentioned above should include the brick mailbox design plans, the materials, mailbox and the labor charges. All bricks can be custom matched to existing brickwork and all boxes should, at a minimum, come with the standard size mailbox. At MJ Masonry Mailbox, for instance, has close to 20 prefabricated kits online, with prices starting at $495. Another company — Mail Box King — has a similar setup, with prices ranging from $550 to $800. 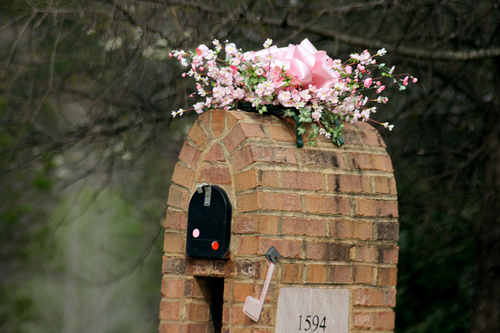 While optional, planters for a brick mailbox cost around $40 to $150 each. Fancier bricks, especially if they have to be custom ordered, can increase the price. Stone numbers embedded into the mailbox can cost $10 to $30 per number. Special keystones can cost anywhere from $40 to $150 each. Upgrading your mailbox to a larger than average size can cost $40 to $80. Keep in mind that if problems or repairs arise in the future, they can get rather costly when compared to a traditional mailbox. If you have an existing brick mailbox and it has to be removed, then a contractor may charge extra to dispose of the bricks. During the build, a contractor will dig and pour a footer to secure the mailbox. Once this footing is created, the bricks will be laid according to the design, with a basic mailbox installed inside. Take note that you will need a sturdy concrete foundation or base for your brick mailbox. This will ensure that your mailbox becomes durable and secure. If you live in a neighborhood that has a homeowner association, check with them before you get a brick mailbox. Many associations require specific types or colors of mailboxes for everyone in the neighborhood. Alo, check with the USPS mailbox regulations before starting the job. No matter where you live, your mailbox will have to so far from the road, and the mailbox inside the brick will have to stick out a minimum amount. It also doesn’t hurt to check with the road department to know how far it should be from the curb or road. Need inspiration for a brick mailbox? Refer to these images on Pinterest. Try to get as many quotes as possible, but don’t focus on the price solely. You will want to make sure these contractors are licensed, insured, have good references and reputable reviews online. If you get a quote that’s too good to be true, the contractor may be cutting corners or they may not even be legally able to perform the job. This isn’t a risk you will want to take. Consider the DIY route if you don’t mind getting your hands dirty. At the DIY Network, they offer a step-by-step guide, showing us how one can be built in a day.